Powerful software solutions for retailers, general merchandise stores. Our POS solution is in single mode or in chains, the central point. Our store checkout turns your computer into a powerful scanner POS with debit and credit card acceptance and supports you effectively in your daily business. 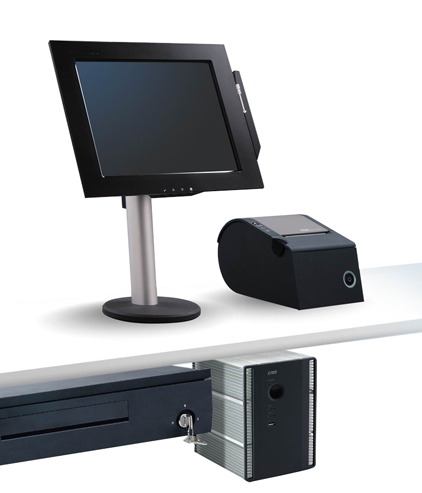 Our POS solution is fully integrated. In the administrative modules, you have available any sales figures of your POS at any time, always online. You will immediately receive all relevant information, e.g. daily sales, open orders or backlogs, unit sales, revenues, inventories and much more. CRM included! We offer loyalty cards & vucher solution combined with our CRM tool. We provide you with a flexible and efficient tool for your customer loyalty concept. In 2000 we offered as one of the first an internet & kiosks sales solution to cinema’s in Belgium. Today, millions of tickets & drinks later, we offer this most complete, and future proof POS technology also to retail organizations with many outlets.